Asterix the Gaul – Colonial Freedom Fighter or Neo-Imperialist? What might a historian of modern empire uncover within the long-running cartoon book series, Asterix the Gaul? Orientalism, French cultural anxiety about American neo-imperialism, and fears of cultural corruption in the face of the forces of global commercialism, of course. 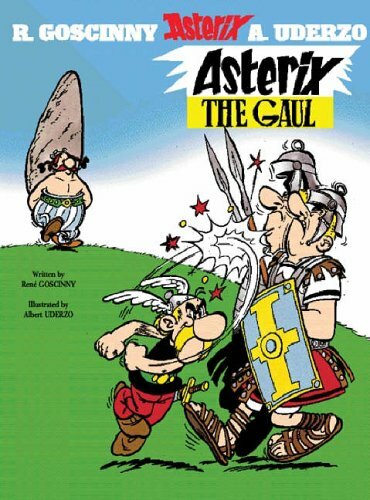 The new Asterix volume, Asterix and the Picts, is not only the first in the series to be drawn/written without the involvement of either of the original creators, Rene Goscinny and Albert Uderzo; it has also led reviewers to wonder whether it can be seen as commentary on Scottish nationalism. The book’s a decent enough effort, but it’s not a classic. To understand the relationship between Asterix and Empire (what else would you expect from this blog?) we need to turn the products of the golden years when Goscinny (the writer) and Uderzo (the illustrator) were working together. This period lasted from 1959 until Goscinny’s premature death in 1977. On the face of it, it seems obvious that Asterix, Obelix and their friends are plucky enemies of colonialism. They conduct assymetric warfare against the hapless Roman soldiers who inhabit the camps of Totorum, Compendium, Aquarium, and Laudanum. Che Guevara style, they export their revolution across the ancient world, helping out their oppressed brethren in Britain, Spain, Corsica and elsewhere. They are battling, explicitly, against an empire that outclasses them in technology and cultural sophistication, yet cannot match them in cunning, bravery, and (druidically-inspired) know-how. But let us pause for a moment and consider who, or what, the Roman Empire represents in these books. It would be tempting to see Asterix as a response to the traumas of German wartime occupation, an effort at dealing with the unspeakable by rendering it comic. There is surely an element of truth in this. Note, though, that the Romans in this world are not much like the Nazis. They are generally bumbling; many of them are arrogant and venal; but some of them at times show generosity, and even nobility. Julius Caesar frequently shows magnanimity at the point when he realises he has met his match. And think too about the techniques that the Romans use to try and weaken the Gallic villagers’ solidarity. 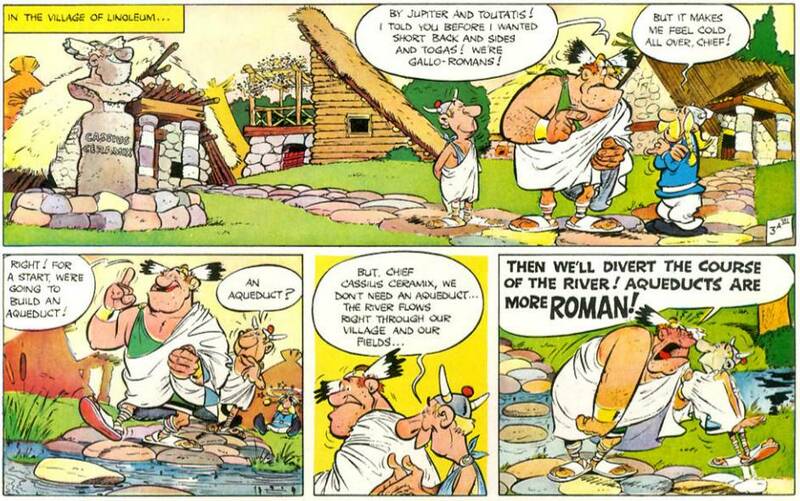 As they can’t compete with Getafix’s magic potion, they frequently resort to the methods of what Joseph Nye termed “soft power.” In The Mansions of the Gods, Caesar plans a luxury housing estate that will reduce the village to the status of a reservation to be gawped at by the Roman tenants. In The Big Fight, the Romans make use of indigenous ‘collaborators’ (alla Gallagher and Robinson) in the form of “Gallo-Romans”, who make fools of themselves by aping their conquerors’ customs and manners. In Obelix and Co., the young Caius Fatuous (graduate of the LSE, or Latin School of Economics)  attempts to buy the villagers off by paying them large sums of money to make useless products. This provokes a protectionist backlash in Rome and, in the face of impending bankruptcy, Caesar is obliged to “Let the menhir float”. So I submit that these stories reflect French cultural anxiety about American neo-imperialism, and fears of cultural corruption in the face of the forces of global commercialism. Reasons abound, then, to think that Asterix is more than simply a symbol of resistance. Asterix is also a symbol of French superiority, and never more so than in Asterix and Cleopatra. The Gauls are called in to help the Egyptian architect Edifis, who is obliged to build Caesar a palace in three months so that his queen can win a bet she has made is Caesar. This is an obvious reference to the activities of Ferdinand de Lesseps, the Frenchman who constructed the canal in the late 19th century, although I have to confess that I somehow failed to spot this when I first read the book at the age of nine. So Asterix has a darker and more complex side, hardly surprising, perhaps, for someone who sprang to life at the very moment that the French were giving up their own empire. And as for the Belgians … well don’t get me started on Tintin. In the French version, he has attended the l’École Nouvelle d’Affranchis (the New School of Freedmen, a term with imperial conotations). The allusion is to the elite École Nationale d’Administration which trains high functionaries of the French state. Caius Saugrenus, as he is called in the original, is believed to be a caricature of Jacques Chirac.